The AMS self assessment is well suited to assist in both the diagnosis of testosterone deficiency and for the monitoring of treatment in patients using testosterone replacement therapy. Low or total absence of sexual thought, desire or fantasy. Lack of interest in sexual activity. Libido is a human desire to engage in sexual activity. Libido is principally driven by the hormone testosterone in both men and women. Low testosterone levels in men and women usually results in low sexual drive and sexual disinterest. Testosterone is produced by the testes in men and the ovaries in women. In both sexes testosterone levels decline with advancing age, alcohol consumption, smoking and the use of some prescription medications. In most cases, restoring blood testosterone concentrations to a normal healthy level increases libido and sexual desire. Most men have a strong libido and have normal sexual function until middle age. Many men in middle age notice a gradual change in body shape, physical activity and sexual desire and performance. This can be due to a number of factors, however an important consideration is testosterone. AndroForte® 5% Testosterone Cream is specially formulated for men with low blood testosterone levels. AndroForte® 2% Testosterone Cream is specially formulated for men with low blood testosterone levels. Low libido is a reduced desire for sexual activity. Testosterone is the primary hormone responsible for sexual desire, fantasy, arousal and sexual function in men. It plays an important role in muscle strength and mass, fat metabolism, bone, energy levels and mood. Low libido in men most often due to a decline in testosterone levels. Low or reduced libido can have a serious negative affect on your psychological health and well being. It impacts on personal relationships and can cause genuine personal distress. Testosterone is the hormone responsible for sexual desire in both men and women. Low levels of testosterone is generally the main cause of reduced sexual desire in men. The extent to which low testosterone is impacting on a man’s quality of life is diagnosed via a combination of blood tests and symptom assessments. Blood tests are taken to measure testosterone levels and provide a snapshot of levels at that point in time only. Testosterone levels decrease throughout the day, being at their highest levels in the morning. We therefore recommend having your blood tests done early in the day. This rise and fall over a 24 hour period is called the testosterone circadian rhythm. 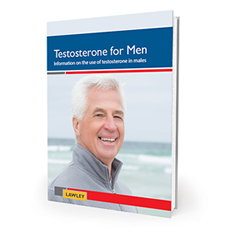 To get an accurate measure of testosterone levels, it is important to combine blood testing and clinical assessments conducted through tests such as the Aging Male Symptoms questionnaire. How is Testosterone Deficiency in Men Diagnosed?